As the term draws to a close, I am reflecting on just how many events have taken place across the ten weeks. Our Year 7 students have settled in very well and are enjoying all that St Joseph’s College has to offer. The inaugural Year 7 Grandparents/Elders event was held on Tuesday 2 April. We had over 250 grandparents and special people here. The boys were so proud as they took them on tours of the school, including their classrooms, and then enjoyed a morning tea in Chieri. Pictured are Mr Mr John Sartori and Mrs Maria Sartori who are the grandparents of Ethan Sartori (7 O’Sullivan). On Sunday 31 March, we held our annual Mass in the Parish at St Thomas More, Belgrave. I would like to acknowledge all the staff, students and families who participated. Our College Rector, Father Chris Ford, celebrated mass supported by Father Jim Acreman and Father Kelly Kam. 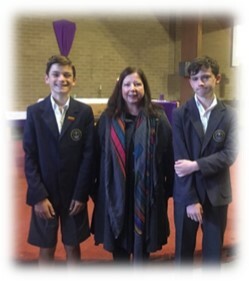 Miss Bronwyn Dean prepared the students including the students who delivered speeches (L to R) William Tyquin (8 Prest) and Samuel Corish (10 Edwards). A reminder to any family who is considering applying for a sibling enrolment in 2020 or 2021, please submit your application as soon as possible. Easter is important because it provides hope in our world. God affirms all that is good in each of us and asks us to work together to build up the Kingdom, trusting that the Spirit of Jesus is within us empowering us in ways that go beyond what we can conceive. We are fortunate at St Joseph’s College because we have the example of Jesus as well as the example of Saint John Bosco. We need to continue to be a place of welcome, a playground where we meet our friends and enjoy each other’s company, a parish that evangelises and challenges each of us to live out the gospel values of love, kindness, forgiveness and respect. We strive to be a place that prepares for life and, although we are imperfect, we do our very best to assist your sons. We would welcome your contribution of stickers from Woolworths to go towards our Woolworths Earn and Learn program. Please feel welcome to drop them off at reception. 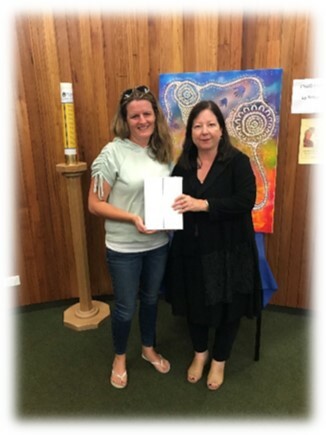 Pictured is Nicole Hoffman who won the iPad raffle linked to the Community Fun Day. In the Community section at the end of this Newsletter, you will find further information regarding a fundraiser we are running in partnership with the Entertainment Book. I encourage you to consider purchasing a membership, which is great value. A reminder to all that from the first day of Term 2, all students are expected in the full winter uniform. Please note that combinations of the old and new uniform are not allowed. Please check the website to see the times that Noone Uniform Shop is open. Noone sells new and old uniform items. On behalf of the staff, I extend to you the blessings of the Easter season. I wish you and your families a happy and safe holiday period, and I look forward to seeing you again in Term 2 which begins on Tuesday 23 April.